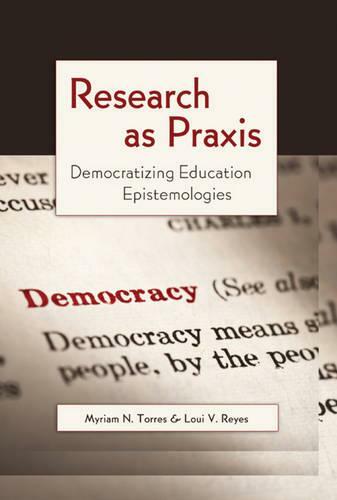 Research as Praxis is an expose of the philosophical, theoretical, and methodological principles and assumptions of Research as Praxis (RAP) as an alternative paradigm of education/social research to the resurgent exclusionary hegemony of the positivist epistemology. The ultimate purpose of RAP projects is to serve the public interest, especially the well-being of students and educators. This is in contrast to projects that serve merely instrumental purposes, like trying to raise achievement test scores. Improvement of well-being can be achieved if research participants are able to participate democratically on an equal footing with researchers in deciding what to study, why, and how to do it, and how to use this knowledge to engage in collective action and dialogic understanding to solve problems and improve their situations. By acknowledging participants' agency and valuing their knowledge and experiences, we increase the chances that research results and experiences will be highly relevant and responsive to participants' needs and growth, as well as to other communities and society at large. The authors draw on the participatory research traditions, especially those experiences made available by researchers, activists, and public intellectuals from the so-called Third World - Latin America, India, Bangladesh, Africa, and the Maori indigenous people from New Zealand. Inspired by those experiences, RAP inquirers blur the boundaries among research, education, and activism, and instead interplay them at all times. This book will be useful to researchers, educators, and graduate students in education, social sciences and services, and humanities.